Size: 95x155mm. Great party favor! Size: 70x150mm. Great party favor! 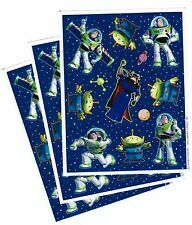 3 Sheets Disney BUZZ Lightyear ZURG Aliens Space Ranger Scrapbook Stickers! This includes 4.5” x 6” sheets or smaller only. ALL sheets are shown in the picture. There are 12 ACID Free stickers per sheet. I will try to answer ASAP! Vintage Stickers - Disney - Mickey, Donald, Pluto - Mint Condition!! There are multiple stickers on each sheet. They are in excellent condition and on their original backing. The sheet is adorable! There are 16 stickers in ONE design. All stickers are shown in the picture. This includes 4.5” x 6” sheets or smaller only. This includes 4.5” x 6” sheets or smaller only. Both sheets are shown in the picture. There are 22 stickers in all. These are not acid free. No free sticker if you buy 1 or 2 sheets. Buy 3 sheets & get 2 free (i.e. total 5 sheets). Buy 6 sheets & get 4 free (i.e. total 10 sheets). You will get 1 sheet of Disney Alice in Wonderland sticker. It has about 19pcs. Matt Clear Sticker. Size 10x16cm. Sheet has 24 sticker on it and is 6" x 4". Buttons - Disney. Dress It Up. 2 G.I. JOE. EXCELLENT NEW Condition. 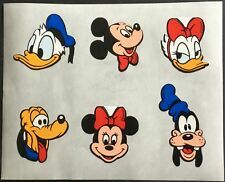 Vintage Stickers - Disney - Mickey & Minnie Mouse - Mint Condition!! You will get 1 sheet of Disney Alice in Wonderland sticker. It has about 30pcs. Matt Clear Sticker. Vintage Stickers - Hallmark - Disney - The Little Mermaid - Mint! Clear plastic sticker. whole sheet size (include back card):7x20cm. - RUSSIA, MIDDLE EAST COUNTRIES - 2-8 WEEKS. - BRAZIL - 2-4 MONTHS. Matt Clear Sticker. You will get 1 sheet of Mosters University sticker. It has about 19pcs. You will get 1 sheet of Disney Zootopia sticker. It has about 28pcs. Matt Clear Sticker. You will get 1 sheet of Disney Zootopia Stamp sticker. It has about 30pcs. Matt Clear Sticker. Size 10x16cm. Disney World Scrapbook Stickers Magic Kingdom 6 Sheets! This includes 4.5” x 6” sheets or smaller only. The stickers contain your favorite Disney Characters, Disney World rides, the Monorail, and more. 300 Disney Mickey Mouse Stickers. New in Box. Whole sheet size (include back card):9x20cm. - BRAZIL - 2-4 MONTHS. Japan Disney Alice in Wonderland. - RUSSIA, MIDDLE EAST COUNTRIES - 2-8 WEEKS. Vintage Disney Stickers - Mrs. Grossman - Goofy - Mint Condition!! There is 1 sticker on each sheet. They are in excellent condition and on their original backing. The mod is adorable! Bullet Journal, Disney Alphabet Letters - Reusable, sturdy, cut stencil. Each stencil is precision cut from durable, flexible 7 mil mylar. This translucent material is easy to clean, food safe, and chemical resistant . One of our suggestions is to use a very dry stencil brush with a tiny amount of acrylic paint.